Oops, sorry. I have no idea what just happened there. It was like I went all Charlie Sheen and got TYPECAST BLOOD coursing through my veins. Which is sort of true... but not really. *fanfare* I love recognition for all the hard work I put into blogging, both on the front of the blog and behind the scenes. Yes, once again I have been nominated for not one but TWO MAD Blog Awards in 2012. 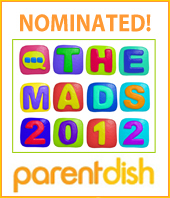 The "MADs" celebrate the UK's best Mum & Dad blogs and are sponsored, once again, by ParentDish. I'm really chuffed to have been nominated for "Most Innovative" for a second year running and also for the brand new category of "Most Helpful". Both of these categories suit this blog down to the ground. I am massively grateful for the first round of nominations that got me through to the finals but I'd love for you to vote one final time to ensure that I WIN AND WE ALL CONTINUE RECEIVING TYPECAST BLOOD. Voting is open RIGHT NOW and will close at 5.00pm on Wednesday 6th June 2012. It's dead easy to vote - you just search for my categories in the menu and use the drop down option to select TYPECAST. Watch out for projects that I'm getting involved with during the build-up to the awards ceremony. I've already signed up for something that is no doubt going to embarrass me and the Most Innovative nominees intend to try and top the lip sync video from last year.